Fluorocarbon fishing line is some of the best line on the market, preferred by pros and serious fisherman for it’s versatility, strength, low-stretch, clearness, and low memory. It has many advantages, but I can tell you from personal experience that if you get the wrong brand or type, you’ll regret it many times over as you untangle a backlash or lose a lure. That’s why you have to get the best fluorocarbon line. Find the perfect waders here! So, what makes one fluorocarbon line better than another? Let’s go into some details here on why fluorocarbon is such a good line, and why some are so much better. If you already know the benefits of fishing with fluorocarbon, skip down to see our reviews. Low visibility. Fluorocarbon lines are some of the least visible fishing lines on the market because it doesn’t catch the sunlight when in the water, like some other lines do. The sunlight instead goes right through it, just like it is part of the water. This makes it a phenomenal line for targeting very skittish fish or when fishing in ultra clear water. Sensitivity. 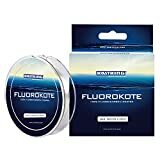 Fluorocarbon is far more sensitive than monofilament, because it doesn’t stretch as easily and because it simply transfers energy, like a bite, better and more efficiently. If you are fishing for a light biting fish, fluorocarbon is the ticket for you. Strength. Fluorocarbon fishing line is more abrasion resistant than mono, and it lasts a lot longer than mono as well. It’s not affected by the sunlight, doesn’t absorb water, and is tougher. You shouldn’t have to worry about it dry rotting unless it sits for a very long time. Sinks faster. Fluorocarbon is one of the denser lines on the market, meaning it sinks faster in water. Depending on your needs, this can really help you with sensitivity and to get down to the bottom. It helps sensitivity by allowing you to tighten your line faster – imagine you have two lines, one mono and one fluorocarbon. The mono sinks much slower than your lure, creating a big arc from your rod to your lure and leaving room for a fish to take your lure as it sinks and you would never know. The fluorocarbon sinks faster and creates a straight line from your rod tip to your lure, giving you a feel for your lure almost as soon as it hits the bottom. This is really ideal for jig fishing, worm fishing, and any other type of fishing where the fish normally hit your lure on the downfall. All these combine to make fluorocarbon the very type of fishing line for finicky fish that are light biters. What type of fish would this be? Walleye, crappie, some bass, and many other species of fish are considered to be somewhat fussy, especially in very clear water. If you fish for any of these and haven’t tried fluorocarbon, you’re really missing out. For this reason, I always like to just have fluorocarbon on my reel 100% of the time, since I switch from species to species. Let’s get into the very best fluorocarbon line that is available for your money. Seaguar InvizX fluorocarbon line is by far and without a doubt the best fluorocarbon line I have ever fished with, and I’ve heard the same things from many other fishermen. The biggest thing about it is it’s complete lack of memory after a use or two, provided you get the proper diameter. 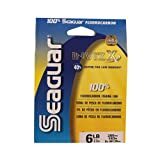 Many other types of fluorocarbon can really be somewhat stiff, but this is Seaguar’s proprietary line that they say is 40% softer, which is accurate in my experience. This line is also ultra sensitive. It felt like I had a whole new rod when I switched from mono to this! I could hardly believe it. I was able to feel bass picking my Senko off the bottom with ease, walleye sucking a leech in, and anything else much easier. This line is basically invisible in the water, and I can’t say I’ve ever had it break unexplainably on me. All in all, Seaguar InvizX is outstanding fluorocarbon line, and I can’t say enough good about it. Whatever you’re fishing for, this will help your connection rate, sensitivity, and reduce your lines memory. It is slightly more expensive than some other lines, but I promise that once you try it, you’ll never go to anything else. Go with line that is the pound test your reel recommends so that it performs as expected – never go much heavier, otherwise you’ll get backlashes and windknots. Sunline Super FC Sniper Fluorocarbon fishing line is also some of the top fluorocarbon line you’ll find for your money. It’s triple coated with resin to ensure that it is soft and supple, and casts well. It offers all the same advantages as traditional fluorocarbon in that it is sensitive, invisible, and very abrasion resistant. This is a step above standard fluorocarbon, and you’ll definitely notice it when casting and feeling your lure. If you are looking for a happy medium between fluorocarbon and mono, this is a safe bet for good line as well. 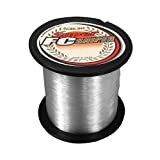 It’s technically not a true fluorocarbon, but it basically is a copolymer fishing line coated with 100% fluorocarbon to try to get the best of both worlds. Since it’s coated with fluorocarbon, it actually offers similar invisibility and abrasion resistance as true fluorocarbon lines, while keeping lower memory than true fluorocarbon since the core is copolymer. It also is almost as sensitive as other types of fluorocarbon. It is also a very cheap option to get started with, and definitely a huge upgrade over any mono fishing line. If you’re looking to save money and get a good line that’ll be reliable and strong without spending more than you’d like, go with this line at the very minimum. This line, since it’s not 100% fluorocarbon, is actually a little thinner than classic line, so look at the diameter when purchasing. Chances are you can get a few more pound test than normal and fit it all on your reel. Buy any one of these top three fluorocarbon lines and you certainly won’t regret switching from braid or mono. They are sensitive, strong, abrasion resistant, invisible, and just all around great to work with. Our top recommendation is the Seagaur InvizX, since it has the lowest memory and it is by far the easiest out of any of these to work with. Since fluorocarbon is a little heavier, it isn’t always ideal for lighter topwater or floating lures since it can pull the lure down a little bit. Depending on what you’re doing, this can be a good or a bad thing. You may have to learn a new knot or two, and you always, always should wet the line with water or spit where you are tying your knot to reduce friction when tightening it. Knot recommendations for fluorocarbon lines are the improved clinch knot, Palomar knot, or Trilene knot. If you are using it as a leader, use the Triple Surgeon’s Knot to tie the lines together. All in all, if you are looking to up your sensitivity and feel, switching to the best fluorocarbon line for the money is the way to go.